Brian Segal, the President and CEO of Rogers Publishing Limited, will be retiring at the end of August, staff were told today in a memorandum from Keith Pelley, the president of Rogers Media. The memorandum described Segal's career as "nothing short of spectacular". Fresh off being the president of the University of Guelph and, before that, president of Ryerson University (1980-88), Segal joined Rogers as publisher of Maclean's in 1992 and became CEO of Rogers Publishing in 1999. In his 12 years at the helm of our publishing company," [Pelly's memo said] Brian has established himself as a formidable influencer and leader not only within our walls, but also in the publishing and media industry in general." The Western Magazine Awards has announced that its 2011 Lifetime Achievement Award winner is to be presented to Vancouver-based photographer, writer and artist Alex Waterhouse-Hayward. "When one considers the range, depth and quality of his magazine photography, which is his overriding passion, and his persistent involvement in the industry since its formative years in Western Canada, no photographer is more deserving," said his nomination package. 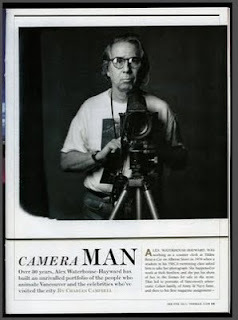 A commercial photographer who's at home in art, editorial, portrait and commercial work, Waterhouse-Hayward (shown at right in behind and in front of the camera simultaneously in a story in the January/February 2011 issue of Vancouver) is best known in the magazine world for his detailed and specialized photo illustrations for magazines such as Vancouver magazine, Georgia Straight and Western Living as well as many American titles. His award will be presented at the 29th annual WMA gala Friday June 17, 2011 at the Marriott Vancouver Hotel Harbourside. Vancouver magazine has been nominated 23 times for the Western magazine awards. Among the other leading in nominations were Swerve magazine, a supplement to the Calgary Herald with 15, BC Business with 12, Western Living/Western Living Condo with 9 combined and Vancouver Review with 8. A full list of nominees is available. The winners will be announced at the 29th Annual Western Magazine Awards on Friday June 17, 2011 at the Marriott Vancouver Hotel Harbourside. [This post has been updated] Canada's History magazine won three times in the third annual "Maggie" awards which wrapped up the annual conference of the Manitoba Magazine Publishers Association. The history title, published by Canada's National History Society in Winnipeg won as consumer magazine of the year, for best editorial package for its feature "Shell Shock" and best non-fiction feature for the article "Isolation", by Cec Rosner. The awards were given out at a ceremony at the Inn at the Forks Thursday evening. In addition to the 16 magazine categories, three student awards were presented for the Red River College creative communications program's annual magazine project competition. The student competition is adjudicated by the MMPA and the best project gets $1,000. All other awards are made by a jury that included Stephen Benstead, novelist and bookseller; Judith Kearns, chair of the Department of Rhetoric, Writing, and Communications at the University of Winnipeg; David Roberts, non-fiction writer and a juried artist and illustrator; and Jill Wilson, editor of the Winnipeg Free Press’ Tab and Detour sections. Each winner received an individually crafted awards plaque created by Manitoba artist Jolanta Solkalski of Clear Energy Glass Studio. "It was very similar to when my parents got divorced. My parents always got along really well, and then one day my mother called me aside and I just knew what she was going to say. And this was the same thing. "I had heard rumors about Domino, but it really was successful. Its newsstands sales were up when everyone else's were down or flat; it was growing and had all this consumer engagement. So I didn't really believe the rumors. And then Tom Wallace, who was the editorial director, called me up -- and he would call me up all the time -- but for some reason that day when he called me up it was the same thing, just a pit in my stomach. Like, 'This isn't going to be good.'" -- Deborah Needleman, talking to mediabistro about Conde Nast's shock closure of the well-regarded Domino magazine she edited. Needleman is now editor-in-chief of the Wall Street Journal magazine. We presume that the pressure to get things done still allows time for lunch. The Canadian Society of Magazine Editors (CSME) is holding one of its periodic Toronto lunches, this time with the topic Be a Task Master: Take control of your priorities and get sh*t done.Presenters are time-management expert Steve Prentice and This Magazine editor-in-chief Graham Scott discussing organizational strategies for magazine editors. It's on Thursday, May 5, noon - 1:30 pm at the Arts and Letters Club,14 Elm Street, Toronto. Admission is $25 for members; $40 for non-members (includes a delicious lunch). RSVPs are mandatory to csmeadmin@canadianeditors.com by Friday, April 29, to indicate whether you prefer a meat or vegetarian option. Fresh off the launch of an anthology he edited for the benefit of PEN Canada, Jared Bland, the managing editor of The Walrus, is leaving to join the publishing firm House of Anansi. He'll leave a big gap in the front line of The Walrus, having played a key role in managing the publication and overseen the fiction, poetry and arts and culture sections of the magazine. He also blogged regularly for the magazine about books, authors and literature. Just catching up with a recent article about the up-and-running Saltscapes restaurant and general store in Truro, Nova Scotia named after the magazine. Our recent post was short on details, so here's more about this very interesting extension of the nimble, ambitious publishing operation. Co-publisher Jim Gourlay told the Chronicle-Herald in Halifax that the transition into sectors besides publishing is consistent with the company’s desire to position itself as a promoter of the benefits of the Atlantic Canadian lifestyle. The new 170-seat dining room and attached "buy-local" retail outlet is intended to be the first of a chain to be located strategically along Atlantic Canada's highways. "The focus of the restaurant and the store will be on Atlantic Canadian products," Gourlay said. "It will celebrate the best of the region’s food and products in the same way we feature the lifestyle of the region and its products in our publication at the Saltscapes expo." One thing that won’t be found on the menu at the restaurant is marine-farmed products such as salmon, which Gourlay said is unsustainable. But products from seafood-growing operations located on land will be featured on the menu, he said. Information over the web has grown more than 50% today, compared with a year ago, according to a new survey by Magnify.net, reported by MediaPost. The sheer volume is partly the result of always being "on" and partly the result of proliferating numbers of devices and services. Steven Rosenbaum, author of Curation Nation, concludes that "... (since) the volume of raw data coming at us has increased more than 50% in the past 12 months... (and) as more digital devices and software services proliferate... data and speed of increase will grow exponentially... (and) will be unsustainable... "
He goes on to suggest that "... algorithmic solutions, better spam filters, smarter search, and more connected devices will fact-expand the problem... (while) human data management, shared and community filtering, and personal recommendations will allow ‘content' consumers... (to) consume curated content... (and) surf less... "
"A year or so before he died, Jay Chiat, who did as much as anyone to make television the coolest advertising medium, was baiting me about the hopelessness of magazines. He argued that the problem with magazine people is that they all really wanted to be movie and television people and so had turned magazines into a swamp of images, which made it impossible to have an ad stand out. We’d out-huckstered the hucksters. And then the Internet—where we cool boys went, creating a vastly deeper swamp of image and distraction." -- Michael Wolff, the editor of Adweek, lamenting the fact that advertising copywriters and art directors fell out of love with magazines, the result of editors' own decisions. Successor in both roles is RDA senior VP/chief financial officer (since Nov. 2008) Tom Williams. In addition, Randall Curran, who joined the RDA Holding Co. board of directors in an April 18 restructuring, was named chairman. Berner is a past publisher of TV Guide (1990-1995) and Glamour (1995-1999), and she was president of Fairchild Publications from 1999-2006 when it was a separate unit under Condé Nast chairman S.I. 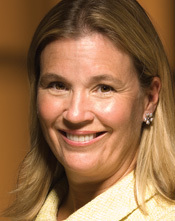 Newhouse, Jr. She assumed her RDA roles in March 2007 as the point person in the $2.6 billion purchase by Ripplewood Holdings that took the company private. The bankruptcy led to new investors. Last week RDA named a new board of directors, initially saying that Berner would retain her seat on the board. Randall Curran, CEO of telecommunications company DELTACOM, Inc., now takes over as chairman of the RDA board. "With the board transition last week, this was a natural point to move on," said Berner in a statement. "I am extremely grateful to all of the employees at RDA for their hard work during my tenure at the company. I am also very proud of the management team and that together we put the company on a path to profitable growth. " A woman in New Brunswick decided to launch a magazine called It's Your Life because the idea came to her in a dream. According to a story in the Saint John Telegraph-Journal, Terri-Ann Cormier had been selling other people's magazines from elsewhere in Canada in her eco-store in Rothesay, but found they didn't meet her customers' needs. "They really didn't pertain to what was going on down here. We're very different from out west. We're several years behind. What they were saying in their magazines didn't really resonate with people down here." Then one night last fall, Cormier headed to bed. "I went to sleep and the idea came to me: 'Do your own, Terri-Ann'. I swear I don't ever remember my dreams, but I woke up the next morning and I said, 'OK. I'm going to do it.'" "So I do what I do best and I started researching. I went out and bought every health magazine and lifestyle magazine and I started ordering them all and I started calling printers. I sat down with them all over the floor, took a look at them and asked myself what do I like best about them and what don't I like about them." Last month, she unveiled the quarterly magazine, which is distributed by Canada Post to 28,000 homes in southern New Brunswick. The magazine can also be subscribed to for $20. Geist magazine of Vancouver is promoting a 2-for-1 deal for subscriptions both to it and Poetry is Dead. We love Poetry Is Dead. It's the quirkiest, edgiest and newest poetry magazine in Canada. We know you'll love it too. Subscribe now for $29.99 and receive BOTH magazines. Usual sub for Poetry is Dead is $12; for Geist $21. Ivor Shapiro, at one time the managing editor of Chatelaine magazine, has been appointed to a five-year term as chair of the Ryerson University School of Journalism in Toronto, effective July 1st. Shapiro had been undergraduate program director after holding a number of posts in the school since joining the faculty as an assistant professor in 2001. His new position gives him overall responsibility for the school's academic and operational affairs including the ongoing review of the future direction of undergraduate and graduate programming. Ryerson is very well known for its emphasis on magazine education. At present, Shapiro chairs the ethics advisory committee of the Canadian Association of Journalism, and is the founding editor and is ethics editor of the Canadian Journalism Project (J-Source.ca), a national website which provides information, commentary and resources related to the practice of journalism. In addition to his feature writing and editing, Ivor has produced numerous papers for refereed journals, conferences and associations. In 2009, he edited The Bigger Picture: Elements of Feature Writing, which is now prescribed in journalism schools across Canada and elsewhere. More recently, he contributed the chapter "What's a good story? Recognizing quality in journalists 'work' in The New Journalist: Roles, Skills and Critical Thinking. 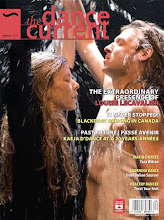 The largest magazine publisher in Quebec, TVA Publications (a subsidiary of Quebecor) has announced concurrent with Earth Day that it is adopting an eco-paper policy. As a first step, according to a press release from Canopy, the campaigners for sustainable forest management and green publishing, TVA has switched 90% of its 52 magazines -- such as Clin D'Oeil and Tout Simplement Clodine -- to FSC-certified paper. The change means that Canada's four major consumer magazine conglomerates have environmentally friendly paper policies in place, with a preference for FSC and recycled content, not fibre sourced from endangered or ancient forests. “TVA Publications is excited to contribute to the conservation of our forests. Places like Quebec’s Boreal forests belong to future generations, making it imperative that we work with our suppliers to ensure the industry continue to strive towards more sustainable forest practices and conservation,” said Chrystal Healy, manager of environmental affairs at Quebecor. “This is the result of both the publisher, printer and paper producers working together to reduce their impact on endangered forests such as the Boreal. I hope TVA Publications example will further inspire supply chain shifts throughout the North American magazine publishing industry,” observes Neva Murtha, magazine campaigner with Canopy. The announcement complements another one recently by Canopy, which published its Printer Leadership List of leading North American green printers who have gone beyond paper policies and become active in forest conservation and the development of eco-paper. -- an anonymous publisher, quoted in an article on paidContent about the scramble by magazine publishers to rationalize their pursuit of online designs to suit an ever-growing variety of devices and formats. The affidavit filed with the integrity commissioner names Ford as the subject of the complaint and asserts that any attempt by the mayor's office to remove copies of NOW from city property amounts to a violation of the Code of Conduct for Members of City Council. The story says if the integrity commissioner found Ford had violated the Code of Conduct, he could face a reprimand from Council [unlikely, given that he and his supporters predominate] or the suspension of his pay for up to 90 days. A formal apology could also be ordered. A story on CTV.ca quoted editor Alice Klein saying that NOW has solid evidence that "someone in the Mayor's office felt empowered to order the removal and disposal of all our newspapers from all city buildings and facilities including all libraries." This apparently refers to the e-mail memo from Lorraine Pickett, a custodial service supervisor at city hall, sent out an email suggesting the Mayor's office demanded the magazine be removed from city buildings. Megan Andrews, publisher and founding editor, a dancer who started a magazine because she felt dancers and audiences needed one, has decided after 13 years that it is time to move on. The magazine is looking for a publisher and an editor, both part-time, to whom Andrews can pass the reins. Applications are being accepted until April 26. "All we're doing is going to the marketplace and saying, ‘You were OK with a crappy product, now how can you not be even more enthusiastic about an obviously better product?'" "The 2010 Benchmarks study is the first “industry portrait” cultural magazines have had in 10 years and it provides cultural magazines with a basis on which they can compare themselves to their peers in a variety of categories: circulation, marketing, promotion, editorial and production costs, overhead, etc. "[says a posting on the Magazines Canada website]. "Each magazine in the study will receive the Benchmarks data pertaining to their language group and specialization (art or literature), and their own magazine’s 2009 figures." The data was compiled by Rowland Lorimer and Jane Hope at the Canadian Centre for Studies in Publishing at Simon Fraser University. Stephen Osborne, Publisher of Geist, member of the board of directors and member of Magazines Canada’s Cultural Magazines Committee, provided assistance and feedback on the design of the study and presentation of the results. An in-depth discussion of the results of the benchmarks study will take place on June 8, 2011 during the State of the Cultural Magazine Nation session at MagNet: Canada’s Magazine Conference. Study participants and cultural magazines in general are encouraged to take part in that session and also join the discussion online at culturalmagazines.blogspot.com. The finalists have been announced for the prestigious Utne Reader independent press awards and four Canadian indy magazines are in the running. The awards are for the best of the independent press and recognize the best in independent political, social/cultural, arts, environmental, international, body/spirit, and science/technology coverage as well as best writing and general excellence. Nominees are selected by the magazine's editors. This way, the magazine honors the efforts of smaller, sometimes overlooked publications that provide innovative, thought-provoking perspectives. All elements, from covers to coverage, are taken into consideration when selecting the nominees and eventually the winners. The nominees appear in the May-June issue, which is on newsstands April 19, and online at Utne.com. Winners will be featured in the July-August 2011 issue. 28% of those surveyed said penguins live in the Arctic, while 46% said they were unsure, meaning just 25% of Canadians know it's not true. "We came up with the North Poll to get a sense (of) how widespread the misconceptions really were," said editor Katherine Sandiford. "The results only confirm our suspicions. They were shameful." See how you do with the poll. Marc Emery, the publisher of Cannabis Culture magazine and now imprisoned in the U.S. has been denied a routine transfer to a Canadian prison to serve out his sentence. It means that he will likely spend the majority of his five-year sentence in US federal prison, according to a posting on the Cannabis Culture site. Unusually, neither Emery nor his lawyer were told of the refusal, but heard it from the Canadian consulate, which had apparently been in conversation with U.S. justice authorities. The US government said it would not approve his treaty transfer back to Canada due to "the seriousness of the offence" and "law enforcement concerns". Emery was extradited to the US in May 2010 after a lengthy court battle. He had been arrested for selling marijuana seeds through the mail. While he ran a profitable business, even the Drug Enforcement Administration in the US acknowledged that much of the money went into funding groups that campaigned for the decriminalization and the legalization of pot possession. Ironically, this decision has come in the same week when Canada's national newspaper, the Globe and Mail, published a lead editorial in favour of decrimininalizing marijuana, which is what Emery has been campaigning for for many years and for which he is now paying the price. Using the Moontoast platform, Magazines.com is offering consumers the ability to share special deals on magazine subscriptions with their friends, with the chance to obtain a substantial group discount if they can recruit enough buyers. Companies can also sell magazine subscriptions through their own Web sites or partner Web sites. The Facebook platform allows marketers and consumers to keep the entire shopping experience within the social stream, if desired; they can also deliver messages about the subscription deal directly to fans of the particular magazines on offer. After a year's hiatus, while editor Rachel Brighton took a sabbatical to work on her Masters degree, Coastlands: the Maritimes Policy Review, is back, with a new Spring 2011 issue. Patient subscribers will have their subscriptions extended accordingly, says a note from the editor. The issue's theme is agriculture in Atlantic Canada with a cover story by Deborah Stiles and Greg Cameron detailing how small-scale farmers are being squeezed out of the food production system. I spent 2010 wrestling with the question of whether the content of the magazine was worthy of the financial difficulty of publishing a very focused print magazine in a digital era. I decided it was and the Spring 2011 issue of Coastlands was printed in March.The next three issues will be published in June (Summer), September (Fall) and December (Winter) 2011. Coastlands is the same magazine that it was before the break in publishing, but with a more mission-driven focus. At root, it asks how a concern for human dignity and social justice should inform public policy. The range of subjects covered in each issue has also been narrowed down to community economics, education, food and agriculture, health, immigration, justice and poverty. Focusing on key subjects should enrich the value of the magazine for readers, by providing greater continuity and depth and expert insight from contributors. The only other change, apart from using more photography inside the magazine, is the decision to include religious perspectives in the editorial mix. This reflects the fruits of my thinking while I have been on ‘sabbatical’ for the past year and is a natural progression for the magazine as it engages more deeply with the question of how human dignity and social justice should inform public policy. I think the best way that Coastlands can provide a critical perspective is by drawing insight from the widest possible circles, including the civil and religious sector, academia, government, business and the arts. In this way, Coastlands can serve as a compendium of current ideas to inform and inspire readers in the Maritimes and beyond. On the marketing front, Coastlands is being sold through more niche retailers that cater to customers with a concern for sustainably sourced products, whether that’s health food or boutique gifts, and more libraries are including it in their collections. These partnerships are helping to establish the core of repeat customers and subscribers, which bodes well for the future. Maclean's magazine has been reprimanded by the Quebec press council for declaring it was "the most corrupt province in Canada" in the cover story of its October 4, 2010 issue. The council released the results of its March 18 decision Tuesday, criticizing the magazine for "lack of journalistic rigour" and for its inflammatory headline. The decision said that Maclean's journalist Martin Patriquin and columnist Andrew Coyne did not offer proof, but merely their perceptions. "We are forced to conclude that they (the comments) reveal prejudice and are all the more condemnable under the circumstances as they carry prejudices against all Quebecers," the council wrote. Following the appearance of the article Rogers Publishing -- but not Ken Whyte, the publisher and editor of Maclean's -- issued a tepid apology. Later, Maclean's and the Quebec winter carnival settled out of court over the use of the image of Bonhomme Carnival as an illustration of the controversial story. The freelance writer and union organizer who took on the New York Times -- and won -- in a landmark U.S. Supreme Court case is now leading the charge against the Huffington Post. Jonathan Tasini, whose name is forever attached to the case Tasini et al vs New York Times*, is heading up a $105 million class action lawsuit against HuffPo, Ariana Huffington herself and AOL, which recently bought the company. A story by Jeff Bercovici was published on his Forbes.com blog. The NYT case was very similar to the Robertson case in Canada, in which freelancers sued a whole range of media companies for damages for reselling their articles without negotiating secondary rights or compensation. The case being made against HuffPo is that it was built upon the work of unpaid bloggers and then sold to AOL for $315 million. At the same time, The Newspaper Guild, representing 26,000 U.S. media workers, has asked unpaid bloggers to erect an "electronic picket line" by refusing to continue to supply free content. "We feel it is unethical to expect trained and qualified professionals to contribute quality content for nothing. Working for free does not benefit workers and undermines qualify journalism." "Anyone blogging for the Huffington Post now is a scab," Tasini was quoted by Bercovici. "They're a strike breaker. They're producing content for somebody who is attacking workers. *Ironically, the Tasini case was something of a Pyrrhic victory; following the decision, the Times announced that it would expunge thousands of articles from its database unless writers gave explicit permission to leave them there -- without compensation -- and many did. The New Republic rather acidly reports in the current issue that Vanity Fair magazine is so obsessed with the Kennedys that about one-third of the issues since 2003 have had at least one article about a Kennedy, written by a Kennedy or mentioning a Kennedy at least seven times. Eliza Gray, a reporter-researcher with TNR points out that Vanity Fair did an April Fool's satire of its preoccupation with a story making a dubious genealogical link with the soon-to-be British princess Kate Middleton and the Kennedy family. But that it publishes stories every bit as ridiculous in an effort to keep the flame of Camelot alive. In the past seven months, the magazine has published four additional articles related to the Kennedys. November’s “Marilyn and her Monsters” included a diary passage describing JFK and his brother-in-law. The January issue excerpted a passage from Greg Lawrence’s recent book Jackie as Editor. The February issue dedicated more than 6,000 words to Kennedy’s inauguration, uncovering groundbreaking material like: JFK felt fat, he had a “dark tan” attained in Florida, and ate “broiled bacon” for breakfast. The May issue includes an Annie Leibovitz portrait of the Shriver family, with a lengthy caption listing the subjects’ accomplishments. Vanity Fair, as even an occasional reader could tell you, has got a thing for the Kennedys. Gray points out that Jackie has been mentioned more than the current first lady, Michelle Obama, and twice as many mentions as Sarah Palin. In what gives a new and modern twist to the concept of "work to rule", the union News Media Guild is recommending that its members working for The Associated Press refuse to do social media postings of their work for the wire service. According to a story on MediaPost, the members are being asked to silence their Facebook and Twitter feeds on Monday and Tuesday in an attempt to pressure The AP management to move ahead with coming to a contract. In that sense, this new strike tactic illustrates how social media can empower rank-and-file content-producers. While they are still producing content (which still belongs to the AP), the ability of individual reporters to build up their own online followings gives them a measure of control over the total audience size. Forgoing social media distribution can also serve to bring their labor dispute to the attention of supporters, who might then exert pressure on the AP. The social-media stoppage also has the advantage of putting pressure on management without breaking any rules or requiring an actual strike, which can do more harm than good. Union president Tony Winton told CNN: "We're trying to basically communicate through social media the unity of our group in trying to negotiate a fair contract with AP." Eye weekly, Torstar's urban weekly, is being rebranded and (as anticipated) relaunched as a city magazine. The renewed publication -- now called The Grid -- will be out on May 12, according to a Twitter announcement by publisher and editor-in-chief Laas Turnbull. The new handle is not some sort of Tron reference, he said. “It’s actually more descriptive than anything. If you look at a map of the city and take out the background and just emphasize all the roadways—North, South, East and West—it looks like a piece of graph paper. So that notion of looking at the city from a street level and a neighbourhood level is very much the direction we’re going editorially,” said Turnbull, who stepped into his role at the Torstar-owned Eye seven months ago. The name change is part of a move in a radically different direction for the publication, he continued. Rather than remain an alternative newsweekly heavy in arts, entertainment and listings, The Grid will essentially be a city magazine for people in their 20s and 30s. “So a younger, hipper, more provocative version of Toronto Life in a weekly guise,” he said. “We’re pretty excited about it because there’s never been a weekly city magazine for young people in Toronto and we think there’s a real appetite for it,” said Turnbull. He added that Torstar has put a lot of resources into the launch. During 2011’s first quarter, 54 new magazine titles were launched, more than double the number (25) of publications that debuted in first quarter 2010. The number of magazines that folded increased slightly from 2010’s first quarter to first quarter 2011; 22 ended in 2010 and 25 titles folded in the first three months of 2011. New launch categories that dominated 2011’s first quarter were regional interest, food and women’s titles. Some of these titles include Plum Miami, Gourmet Italian Kitchen and Harmony Magazine. Reading an interesting editor's note in the May issue of The Walrus magazine, I recalled the conversations in which I was intimately involved during its formative stages about the need for a "third stream" of revenue. That's what editor and co-publisher John Macfarlane writes about and how this third stream (charitable donations from people who wish the magazine and its works well) remains critical to its future. The other two streams (circulation -- subscriptions/single copy sales -- and advertising) are sufficient for most mainstream magazines to make a modest margin and to stay in business. But for a magazine like The Walrus, which retails ideas and long-form journalism, something more is needed. That something else is apparently there so far in sufficient amounts to keep The Walrus afloat. Macfarlane reports that in 2010, supporters gave more than $1.6 million to The Walrus Foundation to make up the difference between what it costs to produce 10 issues a year (about $3.3 million) and what it can raise through the traditional two streams ($1.625 million). He recalls his Quixotic quest to keep Saturday Night magazine alive (it died later, but not on his watch) with a similar mission under similar strictures. "Is such a magazine sustainable? Our contract with the foundation’s patrons is not so different from our contract with the magazine’s readers; both oblige us to deliver the goods. So yes, as long as we can continue to convince patrons and readers alike that its existence is vital, The Walrus will survive. Shelley Ambrose, our co-publisher and executive director of the Walrus Foundation, calls it an “optimistic national project,” which it is. But for me, it is also personal, because in The Walrus the spirit of Saturday Night lives on." The Professional Writers Association of Canada (PWAC) awards have extended their deadline for entries to April 22. There is a feature writing award (for articles of 1,201 words and over) and a short articles writing award (for articles up 1,200 words in length). First prize in each is $500 and a one-year membership to PWAC, which is worth approximately $250. The Magazines Association of BC has announced that Clélie Rich, senior member of the volunteer collective that runs ROOM magazine, is the MABC 2010 volunteer of the year. The award recognizes volunteer achievement by those who provide inspiration for bright up-and-comers and better the magazine industry through their involvement. ROOM is Canada's oldest journal of writing and art by, for, and about women and Rich spent several years with the magazine in the 1990s and returned in 2004 when the collective needed her institutional memory and organizational skills, according to an item in the MABC newsletter. Rich is also a published poet and freelance editor. She will be honoured at Magazines Canada’s Cross-Canada Volunteer Appreciation Reception in Toronto on June 9, during MagNet. Finalists have been announced for the Quebec Association of Magazines/Association québécoise des éditeurs de magazines annual awards. Ad pages in U.S. magazines increased by about 2.5% in Q1 of 2011, compared with the same quarter a year earlier. According to figures released by the Publisher's Information Bureau, reported by Folio:, in the first quarter there were sold 35,755 pages. The increase hasn't yet clawed back to where the magazines were two years ago -- in Q1 2010 there was a 9.4% decrease. The biggest jump in ad pages was Rolling Stone magazine, with a 70.6% increase; 207.5 pages. According Andrew Jung, chief marketing officer of the Association of Magazine Media, 2011’s first quarter marked the fourth consecutive quarter of growth in ad pages and PIB revenue, which rose 6.1 percent in 2011’s first quarter, compared to 2010’s first quarter. Tonight is the launch of the Toronto Standard, a "daily digital briefing", based in Toronto but with a global outlook. Its flag is a revival of a shortlived publication that came out from1848 to 1850. Frey is a two-time gold medal winner at the National Magazine Awards and a contributor to The Walrus. He was a co-founder and editor of Outpost magazine. 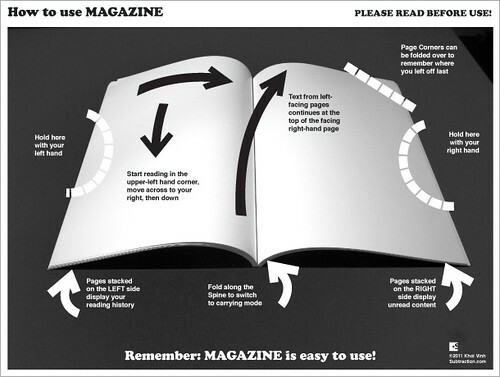 Designer Khoi Vin has taken the mickey out of the sometimes complicated navigational instructions issued with new devices such as the iPad by creating a poster about how to read a magazine.I particularly like directions such as "Fold along the spine to switch to carrying mode" and "Start reading in the upper-left hand corner, move across to your right and then down". The thumbnail here was found on magculture.com; apparently anyone who subscribes to the Stack America magazine service gets a letter-sized print of the poster with their first mailing. [UPDATED] Mischief or mishap? National Magazine Awards finalist list said to be "counterfeit"
For a brief period this morning, a list that was said to be all the finalists for the National Magazine Awards was circulating, with a link to the awards' website. Since the finalists were not supposed to be announced for another month and since judging processes are not completed, it was suspicious as well as surprising. A note from Barbara Gould, the event organizer, said the list was "counterfeit", which would suggest someone created it on their own and were up to no good. However, it is more likely that the list is an internal work-in-progress that was somehow made available online in error [see below]. In which case, the NMAF should say so. A lot of public relations damage is already done, both to those who may have been misled that they were not finalists and to those who are listed who may not wind up on the official list which is issued May 2. How did this morning's inaccurate nominee list get created and released? The NMAF and our web developers have spent the day figuring this out, and here's what appears to have happened. Last year, the NMAF created a page called the 2010 Nominees Report to provide not only a list of nominees but also links to all nominated work. The NMAF’s computer system, including the submission, judging and reporting functions used to manage the Awards, all require a manual update each year to put last year’s information into an archive, and to open a new set of information for the new year. This usually happens after the judging is complete, in preparation for the public announcement of the current year's nominees. This process has not yet been done by NMAF staff or by its web provider for any of the 2011 nomination/winner reports. However, unbeknownst to NMAF staff, the Nominees Report –in unusual fashion—was configured to automatically changeover to the new year and dynamically generate a new report without a manual update. The live link to the 2010 Nominees Report was removed from public view (toggled “off” in the system and links on www.magazine-awards.com content removed) in July 2010. Today, as everyone knows, a “live link” was uncovered and featured a list of 2011 NMA nominees. So how did this happen? Our web provider informed us that the “off” toggle malfunctioned (it has since been fixed). It appears that someone who had bookmarked last year's report clicked on the report link, and that triggered the system to automatically update the report, pulling from unverified, unchecked data elsewhere in the system. The list generated by the system has –until today—not been seen or vetted by NMAF staff and is very much incomplete and subject to change. To reiterate what we said earlier, the judging is not final and the NMAF has not yet created its own nominees’ lists for ANY of the categories for this year’s awards. We sincerely regret the excitement and confusion this may have caused among members of the magazine community. This year's Maclean's university guide has trimmed down. The special interest publication, which has been in the past a major money-spinner for Rogers Publishing, has a new design and a new format. The previous versions over 20 years have been standard magazine size. The new look is presented in a 9 x 7 inch size, according to a story in Marketing magazine. 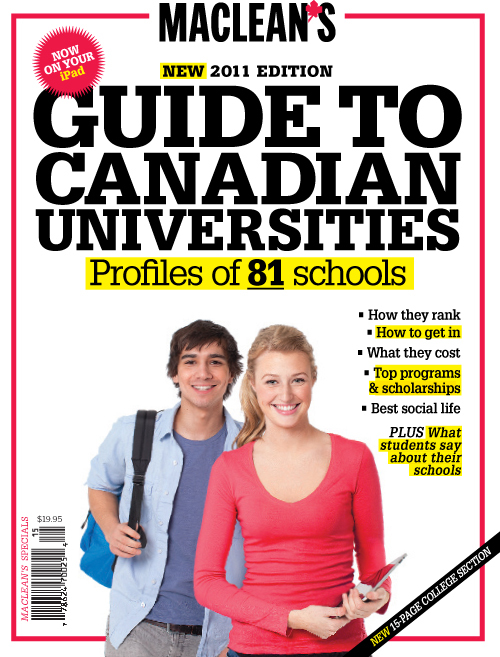 The 2011 issue of the Maclean's Guide to Canadian Universities is on newsstands this week. “It’s really meant to be a utility book,” [said Cathrin Bradbury, the manager of the Maclean's's intelligence unit.]. In addition to the format change to the easier-to-carry book-like size, the new guide features excerpts from Maclean’s annual University Rankings (which appear within the pages of a regular Maclean’s issue). The guide has 256 pages and covers 81 schools, compared with 69 last year. It is augmented by iPad videos. “The iPad really helps with the utility because we only have so much room in the guide,” said Bradbury. Families, friends, colleagues and admirers have banded together to create a fellowship in memory of Jim Travers, the Toronto Star columnist, according to a posting on J-Source.ca. He died suddenly March 3 from complications after surgery and his unexpected death (and their admiration for his writing and journalism) galvanized people to create the R. James Travers Foreign Corresponding Fellowship. It will give an annual award of $25,000 to cover travel, reporting and research expenses as well as a stipend. Travers was a Southam News correspondent in Africa and the Middle East, general manager of the Southam news service, editor of the Ottawa Citizen, executive managing editor of the Toronto Star and for the past decade the Star's national affairs columnist. A seven-member steering committee has set its sights on raising $500,000 that would endow the award in perpetuity; the first award will be made in 2012 and will be administered by Carleton University through its school of journalism and communication in the faculty of public affairs. Details about donations to the fellowship and about the award can be found here. Luminato, the Toronto festival of arts and creativity, has announced that it is partnering with The New Yorker magazine, sponsored by RBC to present a series of lectures and panel discussions during the first weekend of the festival,June 12 & 13. The festival runs June 10 - 19. "Through this New Yorker program, Luminato furthers its commitment to collaborating with extraordinary international partners to curate programs that enhance the overall Festival experience," said Janice Price, CEO, Luminato. "We are delighted to partner with Luminato to bring The New Yorker to Toronto in celebration of the Festival's fifth anniversary," said The New Yorker's publisher Lisa Hughes. "We are most grateful to our partners, RBC and the Canadian Tourism Commission, for helping us bring this important programming to our readers in Canada."